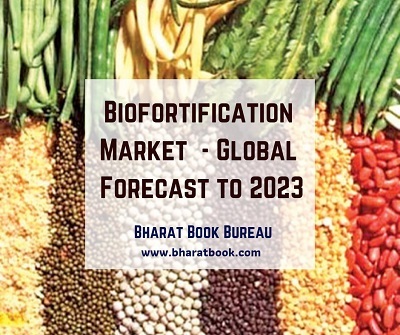 Bharat Book Bureau Provides the Trending Market Research Report on “Biofortification Market by Crop (Sweet Potato, Cassava, Rice, Corn, Wheat, Beans, and Pearl Millet), Target Nutrient (Zinc, Iron, and Vitamins), and Region (Latin America, Africa, and Asia Pacific) - Global Forecast to 2023”under Agriculture Category. The report offers a collection of superior market research, market analysis, competitive intelligence and Market reports. The biofortification market is estimated at USD 78 million in 2018, and projected to grow at a CAGR of 8.6%, to reach USD 118 million by 2023. The growth of the biofortification market is driven by the rise in funds for agronomic practices and technological advancements. A key driver for the market’s growth is the increasing use of high nutritional content in foods due to increasing consumer awareness about healthy diets. Africa is projected to be the fastest-growing regional market. Asian countries, especially India, have emerged as leading destinations, thereby facilitating the market shift from developed economies to developing economies. One of the major restraints in the growth of the biofortification market is low awareness about the benefits of biofortified crops. Based on crop, the sweet potato segment is estimated to account for the largest share of the biofortification market in 2018. The demand for biofortified crops such as sweet potato and cassava has increased with the rising technological advancements to increase the nutrient content, particularly in orange-fleshed sweet potato (OFSP). Africa is projected to be the fastest-growing market in the sweet potato segment due to the ease of biofortifying sweet potato with nutrients such as iron, zinc, and vitamins. Based on target nutrient, the vitamins segment is expected to be the fastest-growing during the forecast period. Growth in demand for functional and enriched processed food products, prevalence of vitamin deficiencies, and feed fortification due to the rise in global meat and dairy product consumption are some of the driving factors for the biofortification market. Africa is projected to be the fastest-growing market for the period considered for this study due to the rising disposable income and increase in demand for nutritional food products, along with the growing technology base, leading to increased demand for biofortification in the region. Africa has rich biodiversity in terms of crops. The development and introduction of agro-innovation across Africa resulted in the adoption of various new technologies in the agriculture industry. The report segments the biofortification market on the basis of target nutrient, crop, and region. In terms of insights, this report has focused on various levels of analyses—competitive landscape, end-use analysis, and company profiles, which together comprise and discuss views on the emerging & high-growth segments, high-growth regions, countries, government initiatives, drivers, restraints, opportunities, and challenges.